MINNEAPOLIS, March 10, 2014 – The Minneapolis Convention Center (MCC), The Arts, Culture and Creative Economy Program of the City of Minneapolis and Meet Minneapolis, Convention & Visitors Association, in collaboration with Northern Lights.mn and the Northern Spark festival announce the winner of the 2014 Creative City Challenge is Balancing Ground, one of three projects vying for public votes to receive the $75,000 commission to create the project and debut at the MCC Plaza on June 14 as part of Northern Spark, an annual dusk-to-dawn festival with tens of thousands of participants, taking place in Minneapolis this year. The project will also be featured on the plaza throughout the summer and host three events for the public. Balancing Ground by Amanda Lovelee, Christopher Field, Kyle Waites & Sarah West is a welcoming interactive space that can be activated by one or 100 people. It is continually transforming, with complex shadows patterns and colors woven throughout the space from an overhead canopy of prisms. Balancing Ground presents a space for playful participation and quiet, reflective moments. It is a space without walls–open to all–built on a foundation of community voices. If you are willing to listen, Balancing Ground will literally speak to you. The installation will consist of long rows of wood benches interrupted with a series of playground teeter-totters, which will be surrounded by a large wood structure with a canopy of prisms and reflective fragments strung between rafters. Further details and a video about the project can be viewed at http://www.minneapolis.org/minneapolis-convention-center/ccc/finalist/balancing-ground. 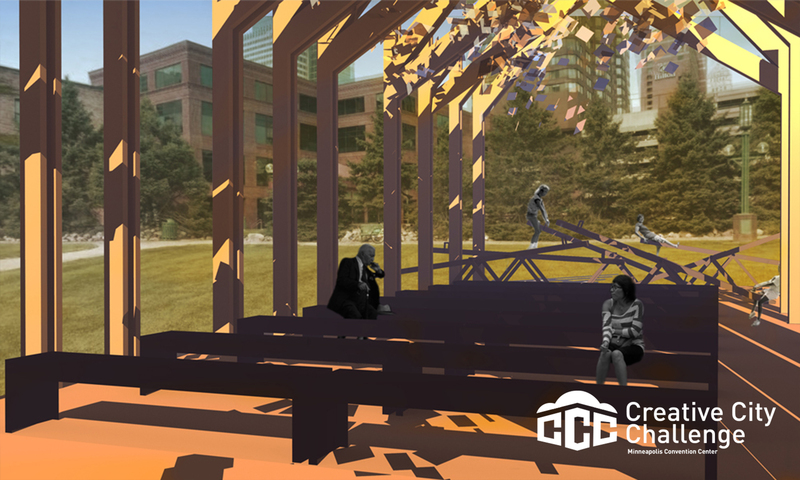 The MCC Plaza and featured project Balancing Ground will host a series of summer events meant to bring residents and visitors out to interact and explore. Balancing Ground will be unveiled and featured at the Northern Spark festival on June 14 at 8:30 p.m. during the opening ceremonies on the MCC Plaza. Northern Spark is the premier dusk-to-dawn public arts festival in Minnesota, expected to draw a crowd of 50,000 passionate attendees. The opening ceremonies will include an address by Betsy Hodges, mayor of Minneapolis, and featured performances. This day is all about empowering the community to be active – both mentally and physically. Attendees start the day with hundreds of others by doing yoga on the open plaza. Throughout the day there will be other mind/body programs like meditation, electronic hopscotch, speed chess, scrabble and more. The day will end with a stage of performances from competitive rap to write fights to dueling banjos. The Minneapolis Convention Center Plaza is a space for participation and social interactions. It is also a portal for discovery of other cultural, natural and retail wonders of the city. This Discovery Day will feature a city-wide mystery game that anyone can solve by discovering hidden treasures in the city. In addition, booths and projects from local schools and organizations will explore everything from big data to hands on environmental science activities. The Do It Yourself (DIY) community in Minneapolis Saint Paul is a strong part of a national and international movement to making things from yarn bombing to robots. Our Maker Day will invite Twin Cities makers such as the Hack Factory’s Trebuchet and Wil Natzel’s cardboard wizardry (as featured on TPT’s “mnoriginals”) to come out and interact with the community, sharing their exciting and original ways of thinking. The Maker Day will include innovative and creative “home brew” projects from the technologically sophisticated to traditional crafts to food and beverages. More information about the events is at http://www.minneapolis.org/minneapolis-convention-center/on-the-plaza/events. Background information on the Creative City Challenge: The Creative City Challenge (CCC) is a competition for Minnesota-resident architects, landscape architects, urban designers, planners, engineers, scientists, artists, students and individuals of all backgrounds to create and install at the MCC Plaza a temporary, destination artwork. The artwork acts as a sociable and participatory platform for summer-long onsite programming, and encourages a sense of connectedness to the city as a whole and its rich cultural and natural offerings. The MCC Plaza is a green roof that is located directly across from the MCC at 1301 Second Avenue South. The CCC’s goal is to draw visitors and residents of the city to the Minneapolis Convention Center as a central meeting space for the surrounding area, as well as to provide a compelling gathering site for the MCC’s thousands of visitors. The commission fee for the selected project is $75,000, inclusive of all artist fees, installation and de-installation costs. 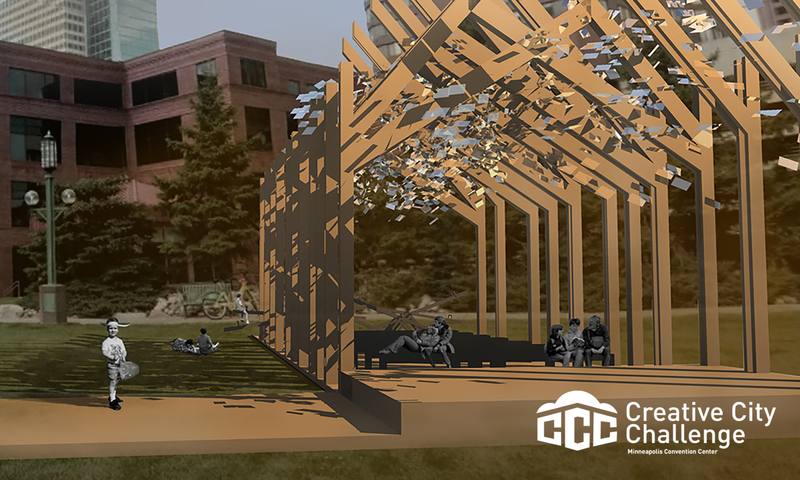 The winning project will remain on the MCC Plaza throughout the summer and be the site of several public events to be announced at a later date. The MCC is a site of convergence for visitors to Minneapolis from around the country and the world, as well as being a part of the local neighborhood, and Minneapolis’ downtown. A jury selected three projects for this voting phase of the competition from among the entries received in the fall of 2013. The three finalists and their corresponding projects incorporate a wide range of art, mixed media and architectural design. ABOUT MINNEAPOLIS CONVENTION CENTER: The Minneapolis Convention Center (MCC) is the largest indoor, contiguous, convention center in the Upper Midwest with over 1.5 million visitors annually, including 250,000 during the summer months. The MCC is more than a meeting place. It’s more than a show space. It’s a building all about building something else…relationships. A blend of form and function, the MCC provides aesthetically pleasing and innovative solutions for a variety of conferences, trade shows and events. With nearly 480,000 square feet of trade show space, 87 column-free conference rooms, a 28,000-square-foot ballroom, and an auditorium with superb production and flexible technology options, the facility can handle any event from a small meeting to a large convention or trade show. ABOUT THE ARTS, CULTURE AND CREATIVE ECONOMY PROGRAM, CITY OF MINNEAPOLIS: The Arts, Culture and Creative Economy program is an initiative of the City Coordinator’s office established August 2011 to leverage the creative sector towards strengthening social and economic growth in the City of Minneapolis. The goals of the program are to: promote and coordinate City resources to develop the arts as an economic generator in alignment the City Goal “art and artists are economic drivers in and of themselves,” to stimulate cross-sector collaboration to strengthen the arts economy and community in Minneapolis and provide presence and visibility for the creative sector in the City of Minneapolis. ABOUT NORTHERN SPARK: On the second Saturday in June each summer, tens of thousands of people gather along the Minneapolis riverfront and throughout the city to explore giant video projections, play in temporary installations in the streets, and enjoy experimental performances in green spaces and under bridges. From dusk to dawn the city surprises you: friendly crowds, glowing groups of cyclists, an unexpected path through the urban landscape, the magic of sunrise after a night of amazing art and experiences. Northern Spark is the one-night arts event people talk about for the rest of the year. For more information, visit northernspark.org. Northern Spark is presented by Northern Lights.mn, a non-profit arts organization whose mission is to transform our sense of what’s possible in public space. Northern Spark is one night, but Northern Lights.mn shines throughout the year with projects such as Creative City Challenge for the Minneapolis Convention Center, The Giant Sing-A-Long at the Minnesota State Fair, and permanent, interactive public art for Saint Paul’s Union Depot.